It began with an unexpected Christmas present. Among the items in Alex Howarth’s stocking that year was a security camera. For a while, he wondered what on earth to do with the gift – but as his home, just south of Preston, backed on to the West Coast Main Line, he had the bright idea of nailing it to his garden fence. After a few weeks of watching trains whoosh by, Alex wondered whether anyone else would like to enjoy the view. He contacted fellow Prestonite Adrian Bradshaw. Class 67 No. 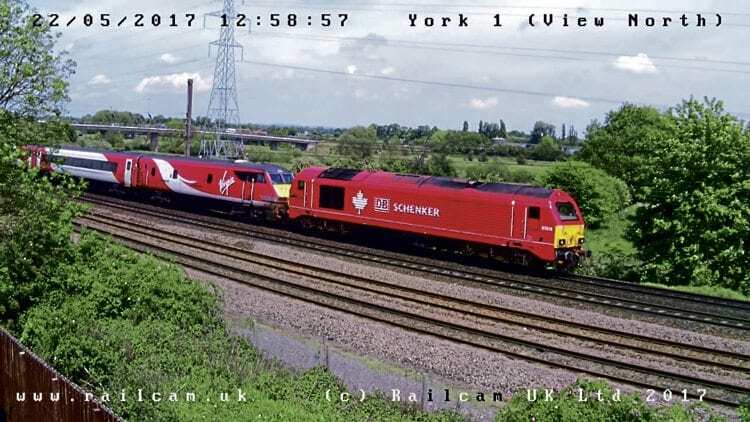 67018 performs ‘Thunderbird’ duties on a Virgin East Coast Mk4 set as the ensemble approaches York on May 22, 2017. Alex has since moved overseas (although he still keeps a fond eye on his ‘baby’), so that original cam is no longer online. However, thanks to Adrian and a large team of volunteers, Railcam.uk (as it is now known) has gone from strength to strength, with more than 50 cameras covering both mainline and heritage sites across the UK – and a few overseas feeds thrown in for good measure. The cameras are all on private property overlooking railway lines. Locations are extremely varied, from residential to businesses, as well as those administered by other railway groups. For example, a link-up with the Friends of the Settle & Carlisle Line has added four views of this famous route, including the iconic Ribblehead Viaduct. Camera hosts get free access to the entire Railcam website as a ‘thank you’. However, it isn’t just about the cameras. Railcam also offers comprehensive live diagrams of almost the entire mainline network – clicking on a train’s headcode brings up a vast amount of detail, including operator details, and both booked and ‘real-time’ schedules. This feature combines live information from a Network Rail-sponsored feed with Railcam’s own custom mapping – the latter proving somewhat challenging to assemble, as Adrian explains.